Today I was doing tons of blog maintenance; editing photos, updating links, answering comments, working on posts. It felt like hours when really it wasn’t even noon yet. How did I get so tired? I felt drained and ready to go back to sleep…NOT good! 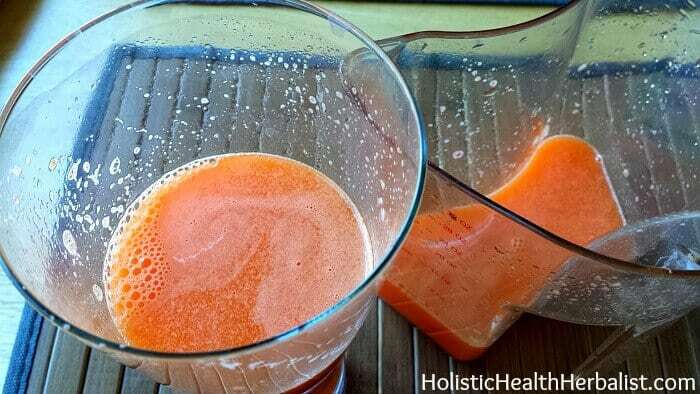 The natural sugars in this juice give you a quick burst of energy, builds the blood, and gives you a nice dose of B vitamins to wake you up and brighten those tired eyes. I love this juice, and it’s always my favorite go to juice when I just want something easy yet packed with nutrients. I really love having this juice when I feel stagnant from blogging all day. The cayenne pepper really gives this sweet juice a pleasant kick! Carrots are mineralizing, rich in anti-oxidants, and are powerful immunity boosters. Not only that, they are packed with nutrient Vitamin A (Beta Carotene), Vitamin C, and E. It is said that drinking 1 cup of carrots juice with provide you with half the daily value of these vitamins. That’s pretty amazing! Carrots also contain a lot of B vitamins, Vitamin K, Potassium, Phosphorous, and Magnesium. Good stuff I tell you! Besides being known for giving you a good dose of vitamin C, freshly squeezed orange juice is rich in flavonoids (most notably hesperidin) and polyphenols, making orange juice a power house of anti-oxidants. Hesperidin has strong anti-inflammatory properties, so it’s great for when my wrist starts getting upset from typing too much. The best way to get more Hesperidin in your juice is to leave on the white pith of the peel on the orange. I do this cut cutting off the peels with a knife so I can leave on the pith. So back to Vitamin C. Oranges have a lot of it! This essential vitamin straight from the source is a potent protector against free radicals, colds, and flu. This is important for me because working on a blog can be stressful at times and that extra protection against getting sick is always a good thing. Ain’t no one have time fo that! Sitting at a desk for hours on end can really leave you feeling sluggish, cramped, stagnant, and a little cold in the extremities. Throwing a nice piece of ginger into this juice really gets things moving again. Ginger is energetically very warming, helps stimulate circulation, is great for digestive issues, and makes any juice recipe taste even better! Plus, ginger will also make other nutrients more bio-available for the body. To top it all off, ginger also reduces pain and inflammation which typically happens to my wrist during long hours of typing. All in all, ginger is a must have! People who are energetically on the colder side of the spectrum (think cold hands and feet) will feel much better if they add just a touch of cayenne to their juices. Since I’m upping my minerals to reduce the torture that is cramping during you know when, I always opt to add a few drops of trace minerals to most things I drink during the day. So far, the results have been amazing! As soon as I started, I began feeling a difference in severity, duration, and just started feeling better overall. Getting your minerals is really important, especially if you have low energy levels and get tired easily. This is my favorite brand. For more juice recipes, sign up for my newsletter here! Thank you for sharing, I cant wait to try your recipe.